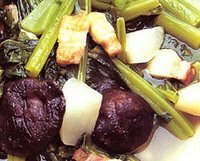 Chinese mustard cabbage with mushroom recipe in Thai called Phak Guang Tong Pad Hed. This manu has benefit for health because low fat and has vitamins. * Wash the mustard cabbage well and cut in 5 cm lengths. Scald and set aside. * Clean and wash the mushrooms and cut in half. * Heat oil in a wok. * Add mushrooms and fry until nearly done, then add the mustard cabbage. * Add sugar, light soy sauce and sesame oil and stir until evenly mixed. * Serve the Phak Guang Tong Pad Hed warm.